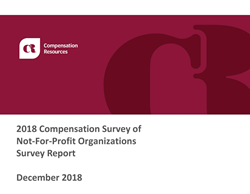 This survey, targeted exclusively to tax-exempt organizations, captured compensation data for positions within a broad range of not-for-profit classifications. This survey also reports the prevalence of various programs and practices relative to executive compensation, covering annual incentives, long-term incentives, various perquisites, supplemental benefits, and agreements, along with processes relating to staff positions. For more information or to order the survey, please contact Diana Neelman at (877) 934-0505 x105 or visit our website at http://www.compensationresources.com.